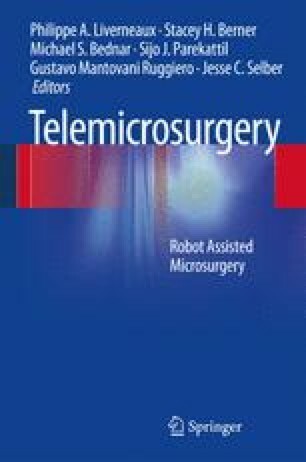 Characteristics of robots are well adapted to open telemicrosurgery: suppression of physiological tremor, optical magnification of the surgeon’s movements and improved ergonomics of the console. The aim of this work is to study the feasibility of limb tele-endomicrosurgery by means of a tele-endomicrosurgical median nerve repair model in the forearm. The forearm of a fresh defrosted human cadaver forearm was placed in the supine position, the body of the robot on the radial aspect of the limb and the instruments being the ulnar side. Five approaches converged toward a central cavity created with dissecting scissors anterior to the median nerve. Then an experimental laceration of the median nerve was performed. Sutures repair was performed with epiperineural stitches of 10/0 nylon using two Black Diamond® forceps and Potts® scissors. Tele-endomicrosurgical suture of the median nerve presented no particular technical problem. However, several difficulties were encountered while performing the approach to the median nerve. Peripheral nerve, vascular and tendinous surgery could very well benefit from and evolve toward less invasive techniques. On reading our results, it seems that a tele-endomicrosurgery feasibility concept has been demonstrated.